Communication with its customers has always been of upmost importance to AgVantage Software. The newsletter features articles from AgVantage staff, Customer Services updates, Customer Spotlight articles, Technology updates, Software Release updates, Conference updates and more! Customers, prospective customers, and business partners may request to be added to the email database by emailing Elise Musall, elisem@agvantage.com. 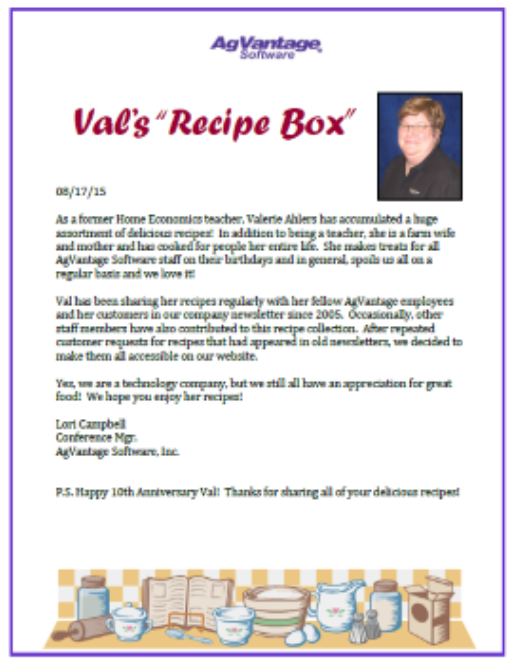 A beloved feature of the AgVantage newsletter is contributing chef and AgVantage Customer Services Representative Valerie Ahler's recipes. These have been printed quarterly since 2005. After repeated customer requests for recipes printed in old newsletters, AgVantage decided to go ahead and put all of them all on the website in a 20+ page cookbook. Enjoy!